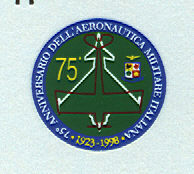 In 1972, the Aeronautica Militare Italiana (AMI) awarded a contract to Aeronautica Macchi to develop a new jet trainer to replace the company's MB-326K trainers. The resultant aircraft, the MB-339A, first flew in 1976 and entered service with the AMI in 1979. The type has enjoyed some export success, and can be found in the air arms of New Zealand, Eritrea, Dubai, Ghana, Nigeria, Peru, and Argentina. MB-339As of the latter country were the first to see combat, and were instrumental in the sinking of the British frigate HMS Argonaut during the Falklands War. This kit first came out in the summer of 1999 as a Frecce Tricolori MB-339A PAN display aircraft; for a preview of this boxing, see my preview elsewhere on this site. The aircraft parts enclosed are exactly the same as those provided in the Frecce boxing, so this preview will cover the parts added for the trainer/light attack aircraft model. As with the Frecce Tricolori MB-339A, molding is superb overall. Underwing fuel tanks are carried over from the earlier kit. The weapons/tip tanks sprue includes two styles of wing tanks--the more common teardrop shape, and the longer, cylindrical tanks carried on later deliveries to the Aeronautical Militare Italia (AMI), Eritrea, and New Zealand. When I previewed the Frecce boxing, I bemoaned (slightly) the lack of tip tanks to build a Frecce aircraft in travel configuration--well, here they are in this boxing! The Frecce Tricolori use the cylindrical tip tanks. 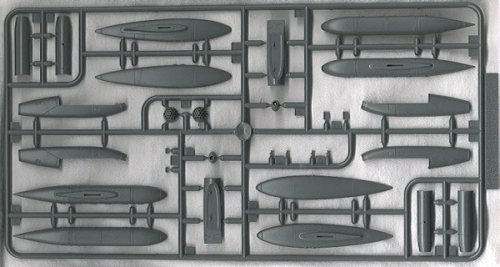 Armaments sprue included in the MB-339A kit. In addition to the wing tanks, rocket pods are provided, with sharply defined openings for the rockets. Shoulder-mounted cannon pods are also given. The openings for the cannon barrels are wonderfully sharp, and into them are attached are solid brass, turned, HOLLOW-TIPPED cannon barrels! The soon-to-be-famous turned cannon barrels! The cockpit detail is excellent. This boxing adds gunsights to both cockpits, which come in four pieces each. About the only things the cockpits will need are harnesses for the ejection seats and throttle handles. This kit has very few flaws. The small wing fences outboard of the large wing fence are holdovers from the Frecce boxing; non-Frecce aircraft do not have these wing fences, so they will have to be removed. That should take all of, oh, five minutes to do! The other flaw (and I'm really reaching here) is that the tail antennas needed to make a New Zealand MB-339C are not included; they are square antennas, not unlike those on a Jaguar, and should be easy to fabricate for those wanting a Kiwi Macchi. Dry fitting shows that this kit will practically fall out of the box assembled! The only hard part looks like it will be putting together those tiny, four part gunsights. The major components fit together as well or better as any comtemporary Tamiya kit, so no worries there! The presentation of this kit shows a great deal of class. 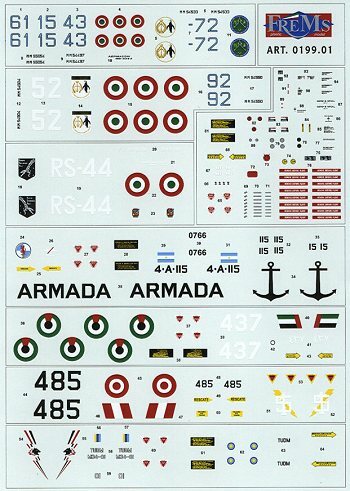 FreMs can teach Revell-Monogram a thing or two about flip-top boxes; theirs is a heavy fiberboard affair with profiles of two of the decal options on the side and a full-size photo of the decal sheet underneath! The instructions are well drawn, well thought out, and very clear; they are printed on heavy paper, almost card stock in feel. Painting and decaling instructions for the seven aircraft options are given on a seperate sheet, which includes a full page of FS595 matches for each color given; FreMs wisely did not match colors to any one paint brand. 1. 61st Brigata Aerea, AMI: overall ghost gray with dayglo orange striping on the tip tanks. This is the only box scheme that uses the later cylindrical style tip tanks. 2. Scuola Volo Basico (Basic Flight School), AMI: Green and medium gray camoflage over light gray with dayglo orange on the wingtips and outer tip tank faces. 3. Reparto Sperimentale Volo (Flight Test), AMI: White and orange trainer scheme. 4. 4th Escuadra AeroNaval, Argentine Navy: This is ship 4-A-115 flown by Teniente de Naval Owen Crippa on the attack of the HMS Argonaut during the Falklands War of 1982, where he scored the lethal hits. The scheme is from after the attack, including a ship "kill" marking on the nose. Camoflage is green and tan over white. 5. Maylasian Air Force: This has green and tan camoflage over light gray with dayglo orange tip tanks. 6. Fuerza Aerea del Peru: Tricolor camoflage of green, dark green, and brown over light gray. 7. Dubai Air Force: Brown and Gray camoflage over light blue. There's even a group of "Remove Before Flight" tags, and rescue markings in the language (yes, it's readable) of each nation given. Amazing! The decal film looks thin and workable, so decals should go on nicely. This kit begs the hoary old kit review cliche: the hardest part of building this model will be deciding what markings to use! In my opinion, this is the finest kit of a contemporary military aircraft that I have ever seen. These kits are, fortunately, being priced lower than they were before, and at $30.00, you'll get practically everything you need to make a stunning Macchi. With any luck at all, this FreMs kit will set the standard for all contemporary jet kits to follow. My congratulations to FreMs for a job well done! drawings of the MB-339 plus drawings that illustrate variant differences. The profiles include a number of the aircraft depicted on this sheet.